A pioneer in decorative heating, Rasmussen leads the way with beautifully crafted gas log sets made from the finest quality refractory ceramic materials. Rasmussen gas log molds are created from select pieces of actual wood reproducing the finest bark detail. Environmentally safe ceramic coatings are hand applied in a multi-step process to recreate the random complexity of real wood for a surprisingly natural finish. Rigid steel reinforcement ensures a sturdy, long-lasting log set and a carefully designed burner system produces the most realistic wood fire look in decorative appliances. This burner provides a tiered ember glow for full flame and has a 150,000 BTU output. It combines a lower burner for a large ember bed and an upper burner that sits directly under the logs for a taller and fuller flame. Let the TimberFire Log Set from Rasmussen bring the timeless beauty of a glowing log fire into your home. This Rasmussen Gas Log set includes: Vented Gas Logs, Vented Burner, Grate, Sand, Ember Magic, Connector Kit, Damper Clamp, and Instructions. 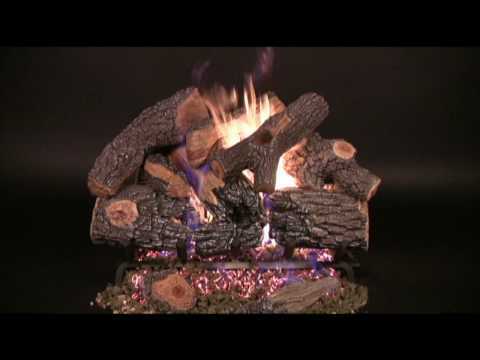 This log set is as realistic looking of any I have ever seen; although it is not primarily for heat as compared to aesthetics, it does put out allot of heat if you have sufficient gas supply to feed the burner. I now have three of these log sets purchased over the last 8 years. Using in a remodeled masonry fireplace 36w x 31h x 29d. Fits perfectly with plenty of logs to fill the space. Good heat and easy to use. We bought two identical sets of Rasmussen propane logs. One set was would not pass a certified leak test performed by the technician installing the logs. Rasmussen was uncooperative and unresponsive....they claimed there was 'nothing wrong with our logs'. Another burner was finally shipped and the second set has been installed and is working properly, but Rasmussen has been a major PAIN to deal with. I will never buy their brand again.